Vox introduced their revolutionary "Blue" Valvetronix AD60VT and AD120VT amplifiers in 2002. They featured an innovative preamp section that combined a 12AX7 powered "Valve Reactor" circuit with digital audio modeling to recreate the sound of sixteen of the world's most iconic guitar amplifiers. Vox AD60VT and AD120VT amps also included realistic simulations of ten classic "stomp box" pedals and a multitude of digital effects such as chorus, flanger, phaser, tremolo, rotary, echo (x3) and reverb (x3). Combinations of amp models, pedals, digital effects and control settings could be stored in one of 32 user programs for instant recall. All of these amp models, pedals, effects and user programs could be remotely accessed using the optional Vox VC4 or VC12 floor controller. Introduced in 2003, the Vox Valvetronix Tonelab was a multi-effects processor for guitar based on the preamp circuitry of the Vox AD60VT and AD120VT. 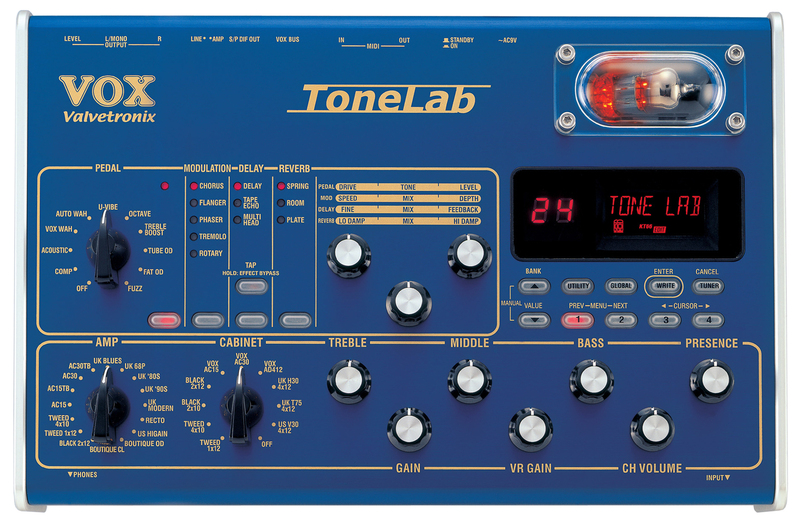 Like the "Blue" Valvetronix amps, the Tonelab included sixteen amp models, ten pedals, five modulation effects, three delay effects and three types of reverb.Program storage was increased from 32 in the AD60VT and AD120VT to 96 (48 preset and 48 user programmable) in the Tonelab. The Tonelab also added ten speaker cabinet simulators not included in the "Blue" Valvetronix amplifiers. A Vox VC4 or VC12 floor controller could also be connected to the Tonelab for remote access of amp models, pedals, effects and user programs. In addition to traditional ¼" analog audio in/out and midi in/out jacks, the Tonelab also included a S/PDIF output connector for direct-to-digital recording. Editing and patch librarian software was downloadable from the Vox web site. Dimensions and Weight: ~12.5" x ~8.4" x ~3.1," 5.5 pounds.